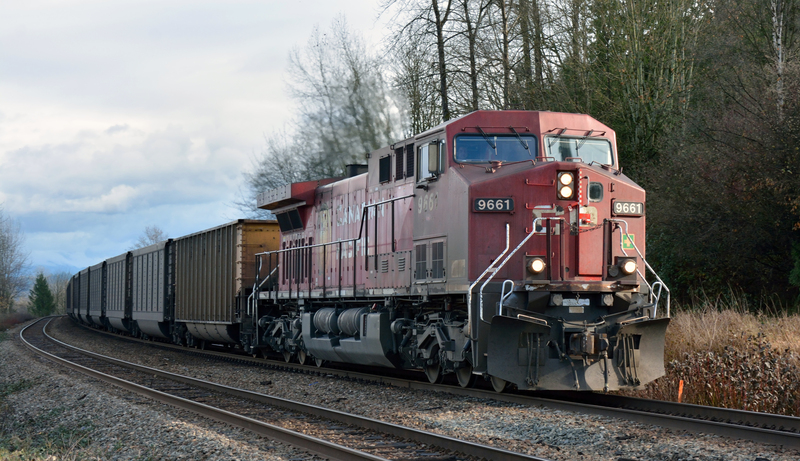 Some action along CN's Yale Subdivision. 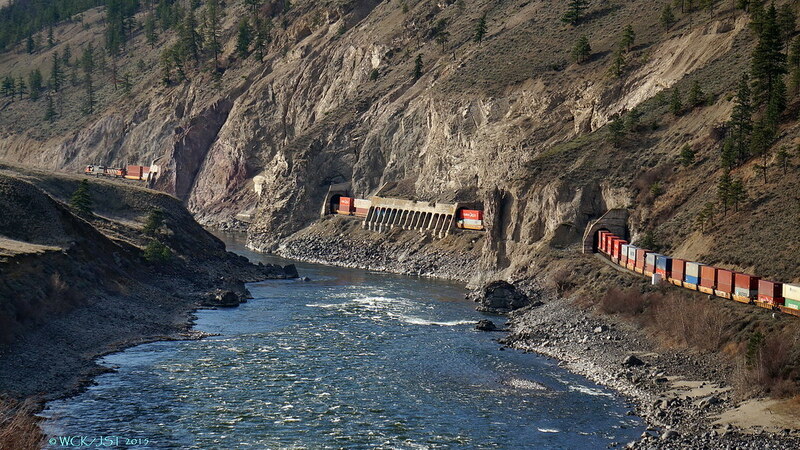 The Thompson Canyon between Skihist & Spences Bridge - is this the Holy Grail of Rail? 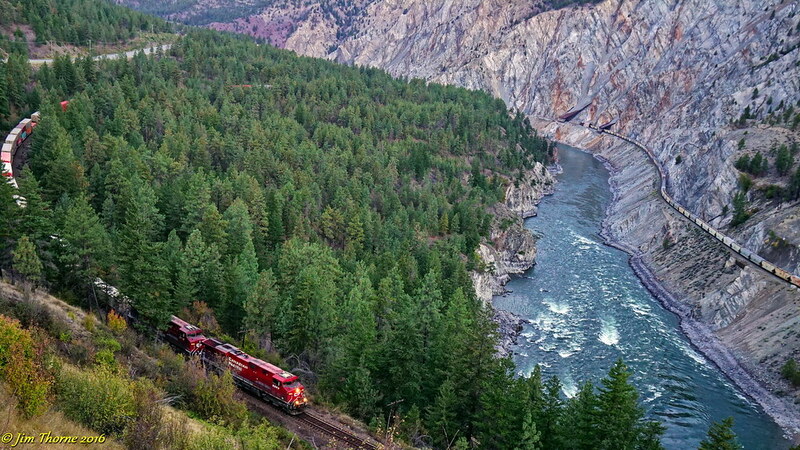 This place combines superb train watching with great scenery and its good practically at any time of the year. These photos were all taken in pretty much the same spot over a thirteen year period. 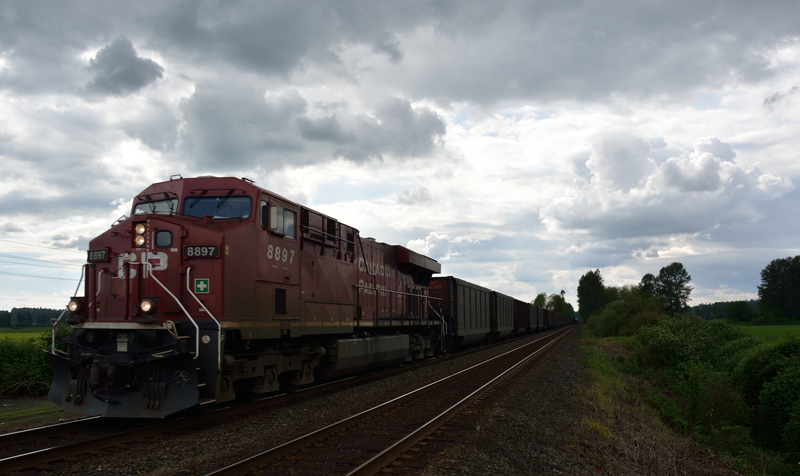 This is CN's Ashcroft Subdivision, showing both CN & CP trains moving west toward the coast. CP's Thompson sub is visible on the other side of the river. 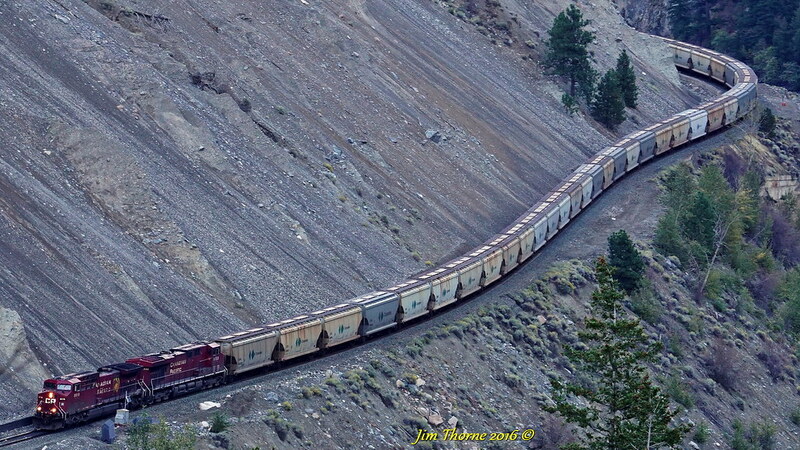 Coal train in Thompson Canyon near Spences Bridge - ~24 June 2000. Film original. 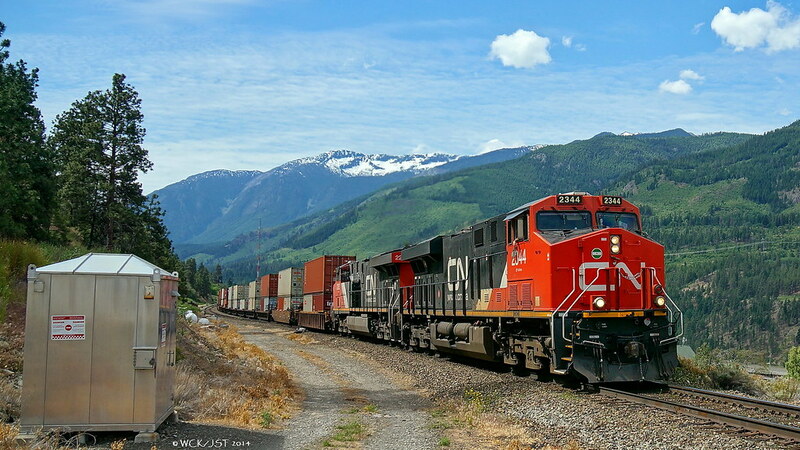 CN 2256 leads west bound box train on Ashcroft Sub, just east of Lytton, BC - 17 March 2013. You can just make out the mid-train DPU in the distance. 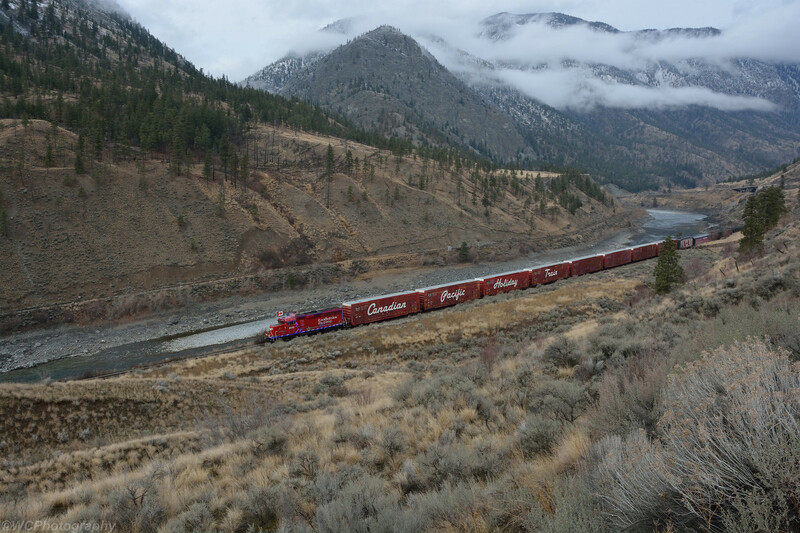 A time lapse on CP Rail that starts at CN's Thornton Yard, and ends in China Bar. Enjoy the trip! A very interesting video, though it ends at Hell's Gate (where the air tram is located), not China Bar. 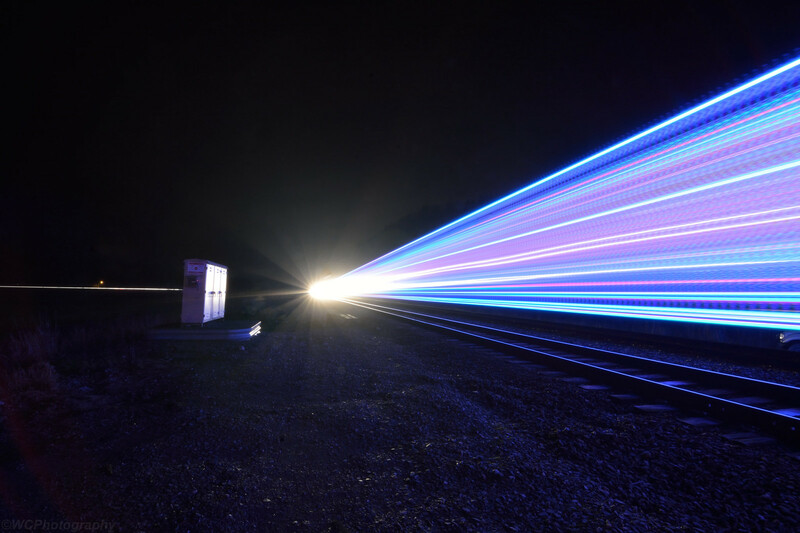 The time lapse makes it look as if the train is moving at TGV speed over rail that is most certainly not up to TGV standard. 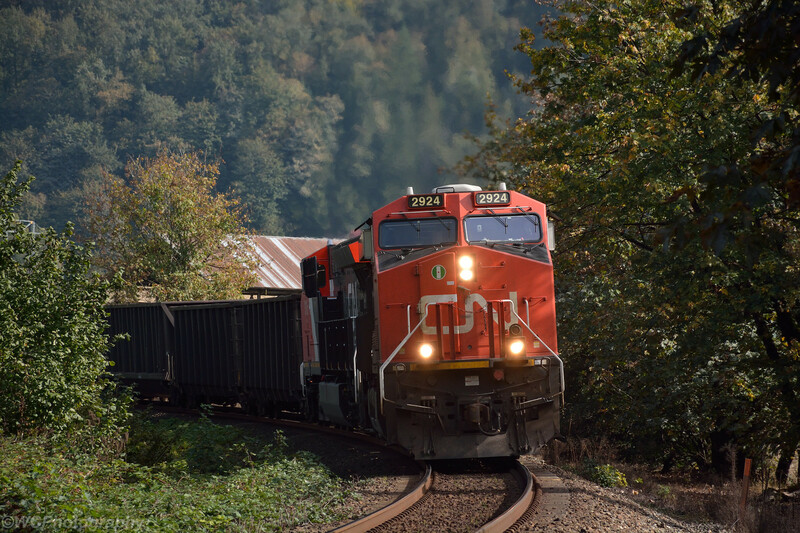 A Eastbound CP intermodal train waits at the end of double-track at Glen Valley for two Westbounds to pass. 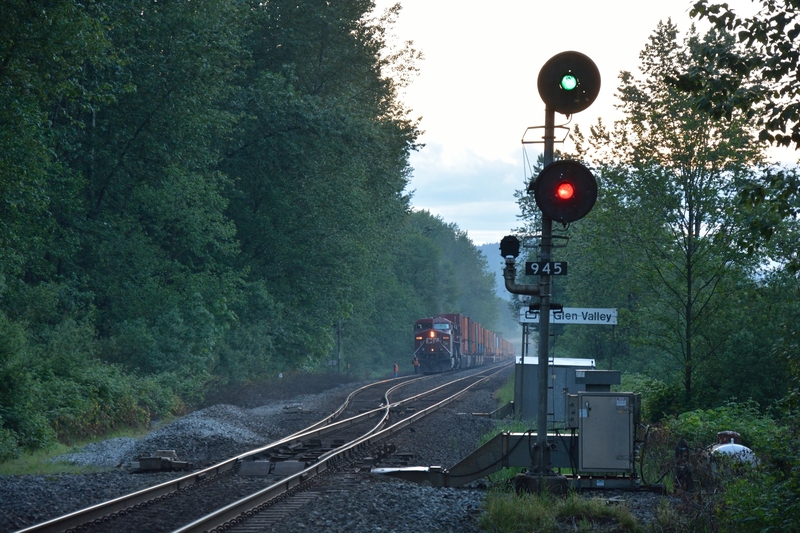 A shot I've wanted to get for months, but which required the long evenings of June, the Eastbound VIA Rail Canadian passing the old station at Fort Langley. 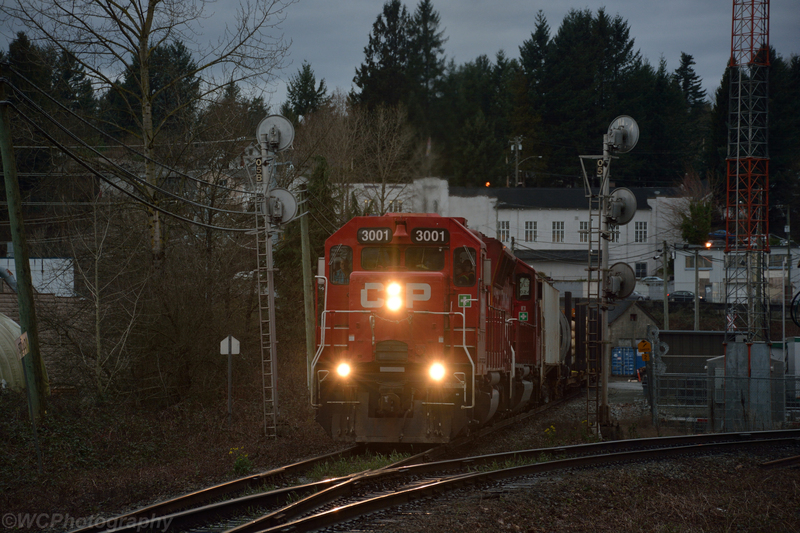 Managed to snap this inbound container freight in Glen Valley / Fort Langley, purely by chance. 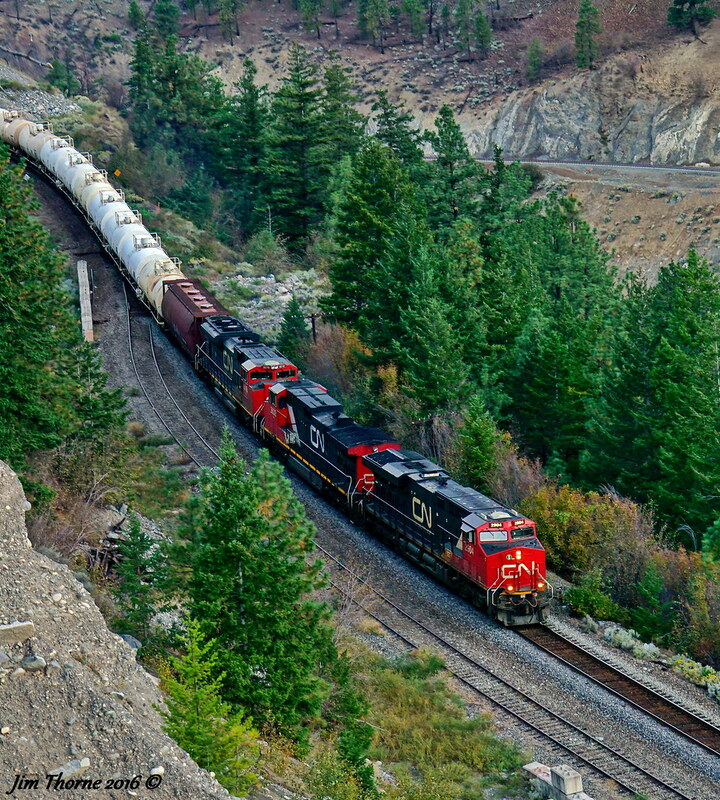 Westbound CP coal train on CN's Yale Sub. Here's a video that I found on YouTube. 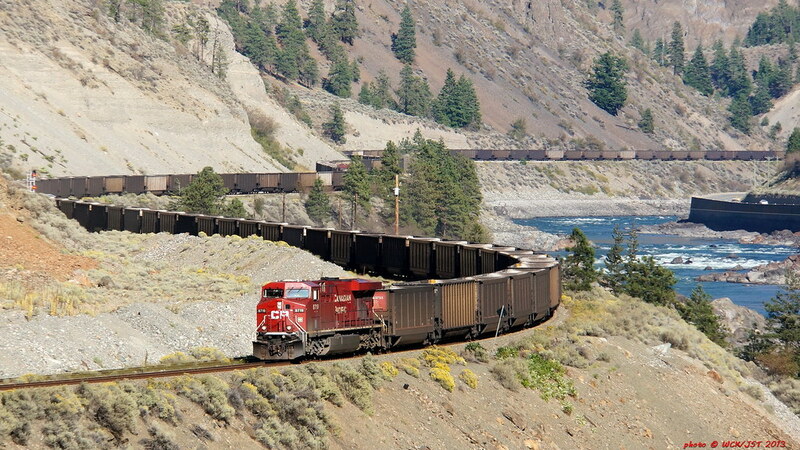 At the 1:55 mark, there is a shaky close-up of the Roberts Bank coaling facility, and some CP trains. Pretty strange video channel, the guy seems more interested in ferries and sunsets, then in meaningful things like trains. 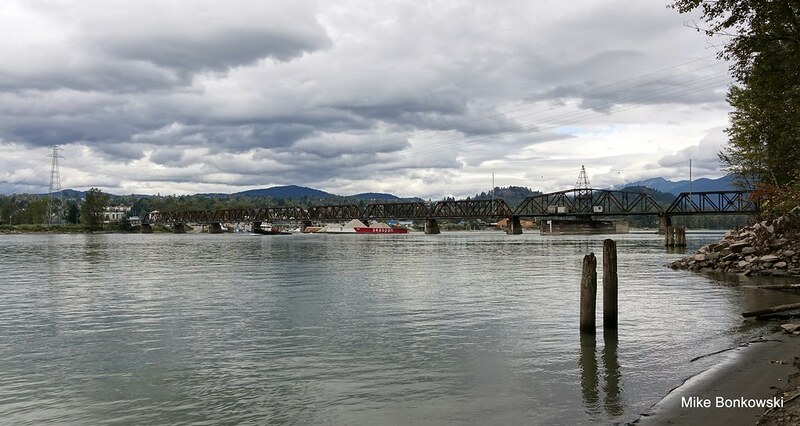 The Mission BC rail bridge over the Fraser River is the western end of directional running. The survey boat "MV Profiler" is shown at the start of this video. Does anyone know what type of work she does? I'm assuming it has to do with the sediment in the river. 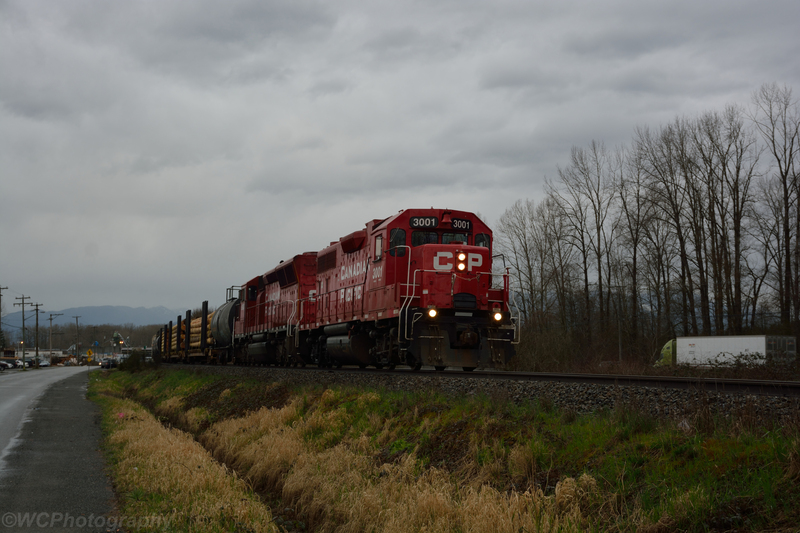 Two views of the Eastbound Sumas Turn on CP's Cascade Sub and Mission Sub. 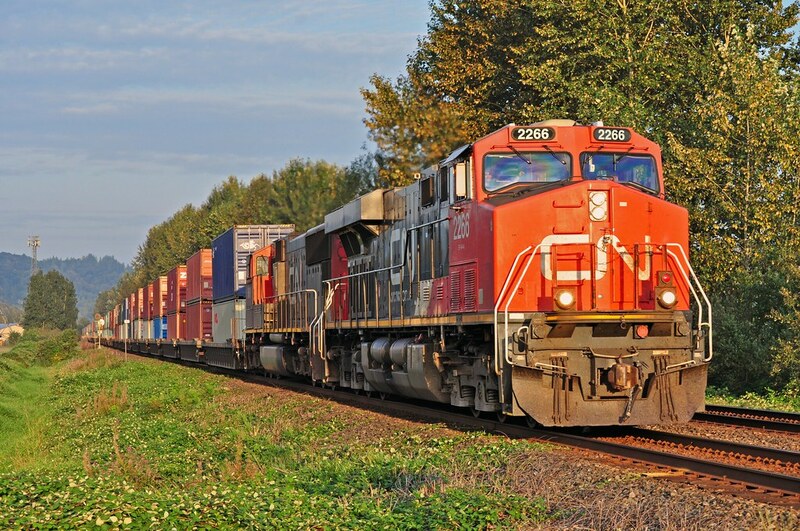 Power was 3001, a GMDD GP38AC, and 5000, class unit of the SD30ECO rebuilds, which are created from old SD40-2s. First, near the old Albion Ferry dock. ..and climbing up to the Mission bridge to head south to Sumas. 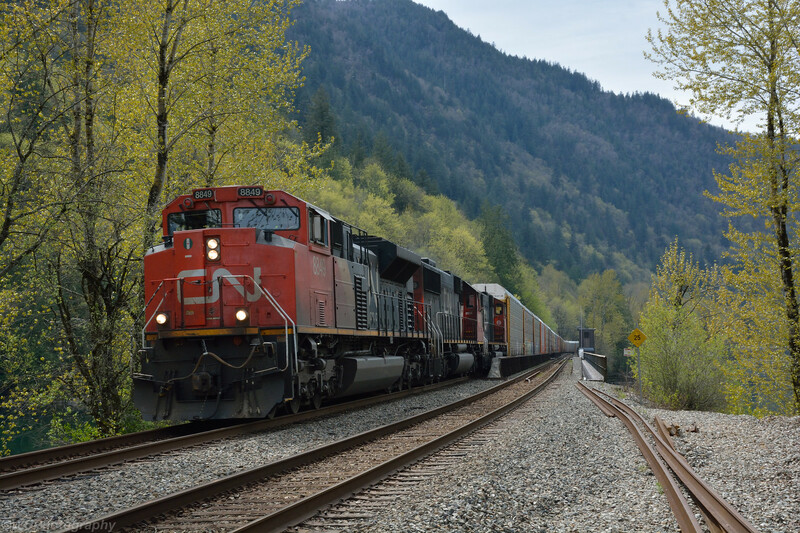 CN Train 355, the daily Prince George-Vancouver freight (it's eastbound counterpart is 354) crosses the Anderson Creek bridge after getting a fresh crew at Boston Bar. Why does this daily not come down the BCR line? The simple answer is costs. 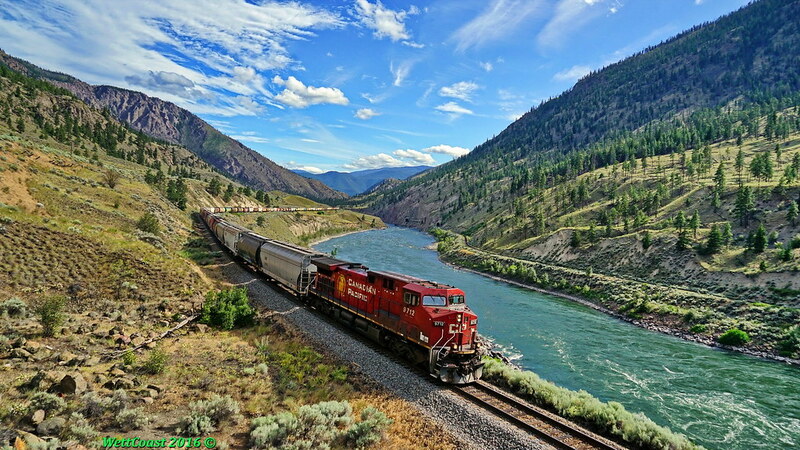 A train running from Vancouver to Prince George via Kamloops & Tete Jaune Cache has a significantly longer run that it would have over the BCR route via Lillooet & Williams Lake. The long route, however, is the 'flat route' whereas the short route is up & down with steep grades over much of the route. 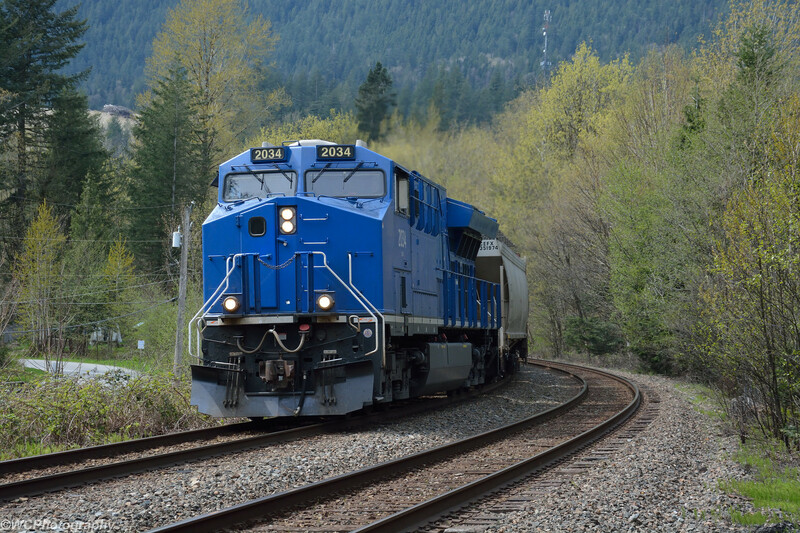 Twice as much power (maybe even more than twice) is needed to move trains over the hilly route. 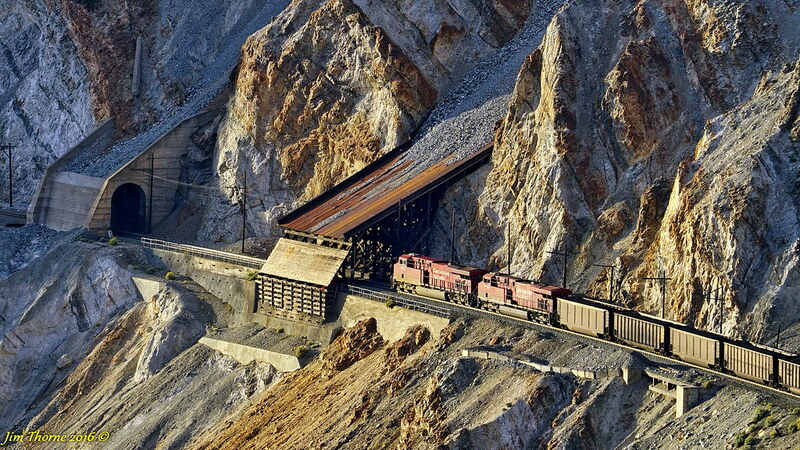 There are other operational constraints as well such as braking heavy trains on steep descents. Those grades, extra power needs & other constraints mean that the long route is actually the cheap route. 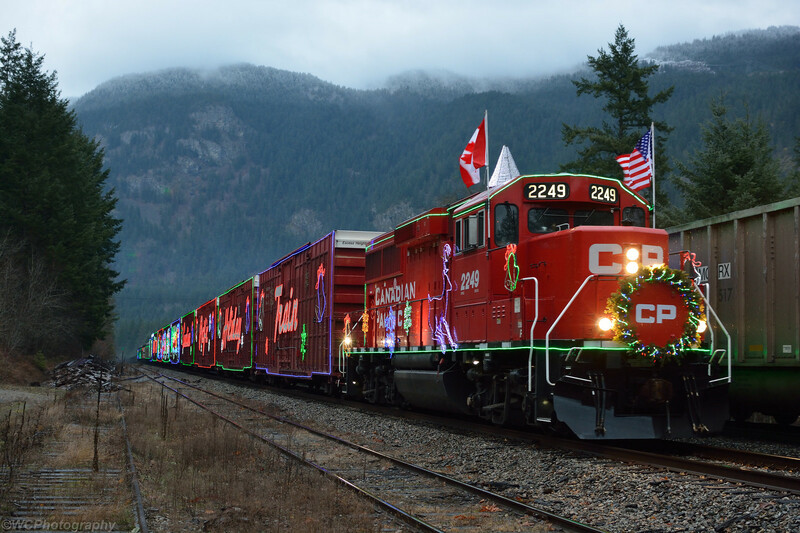 Mike , you say that CN designates these trains as 355 (west bound) & 354 (east bound). 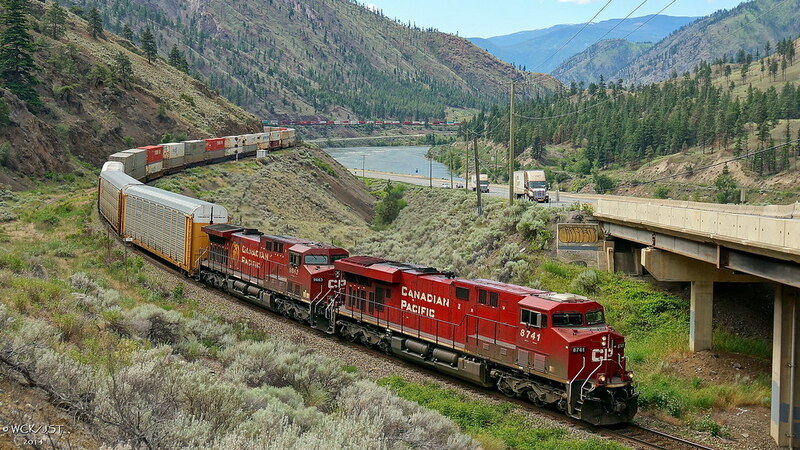 Do these trains keep the same numbers between Tete Jaune Cache & Prince George, where the east bound in now west bound (& vice versa for the train going 'south' to Vancouver? 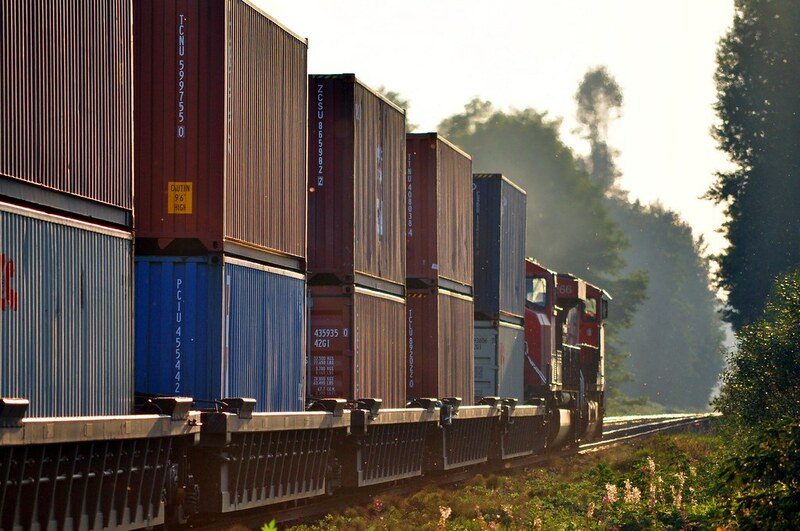 Trains over the BCR route are designated as north & south, of course. Trains connecting via the 'flat route' are designated as east or west, but are in fact going north. 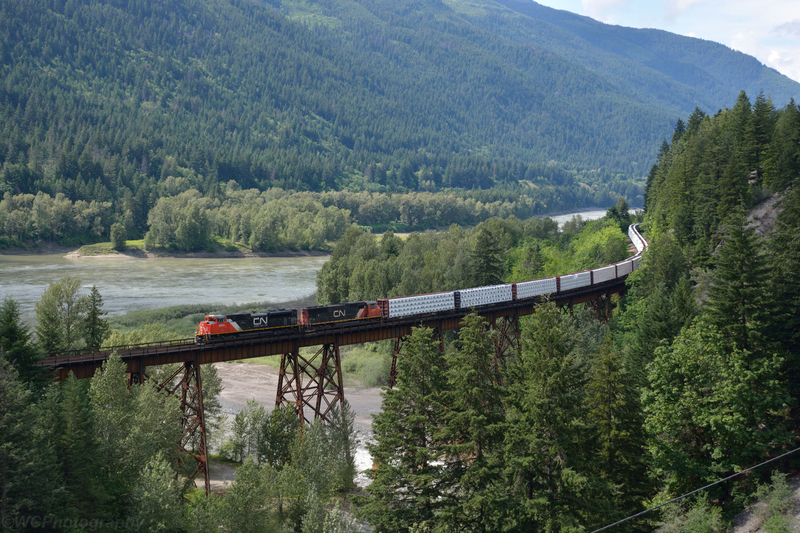 Another interesting tidbit about these trains is that for a short distance the east bound train will run ACOT (against the current of traffic) on the Robson Sub between Valemount & Tete Jaune Cache. 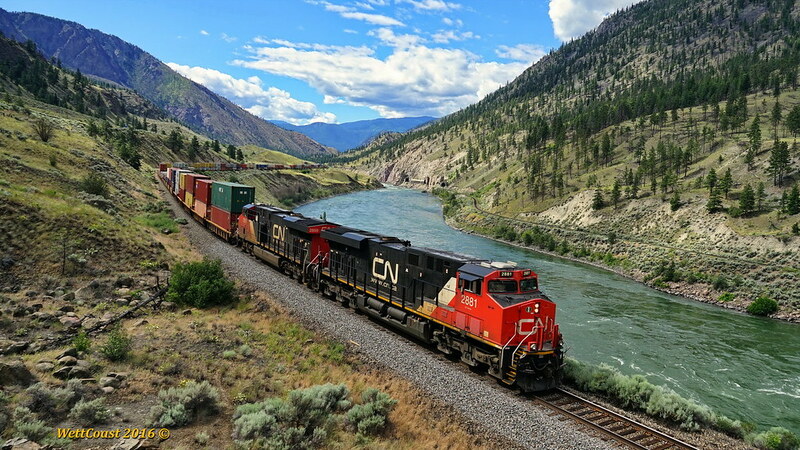 On different days at Canada's 'holy grail of rail' in the Thompson River canyon just below Spences Bridge, BC ... 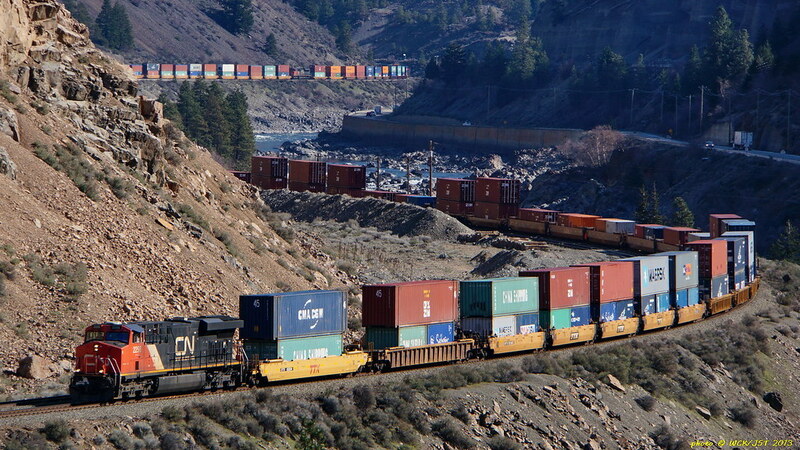 The CN tracks on the other side of the river can offer up some pretty dramatic train photos' too. Two photos, taken a few weeks apart. 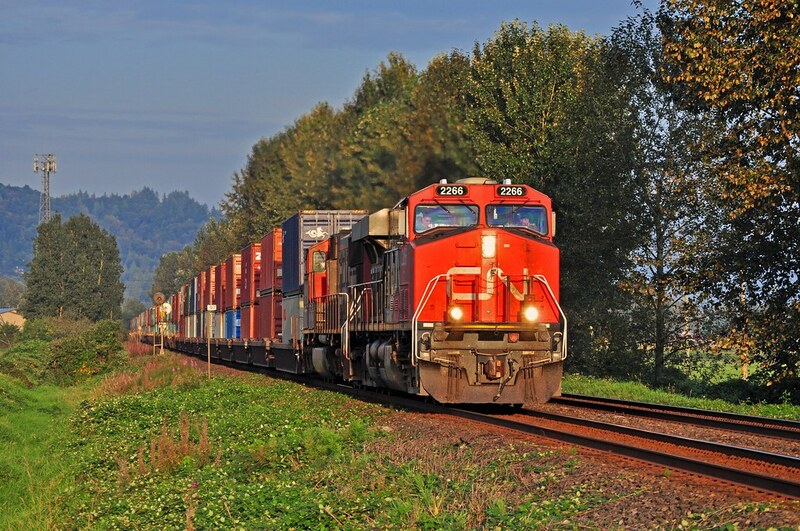 First, a shot taken on September 11, near Glen Valley at Mile 97, on CN's Yale Subdivision, of CN intermodal train 101 meeting the Prince George bound 354. 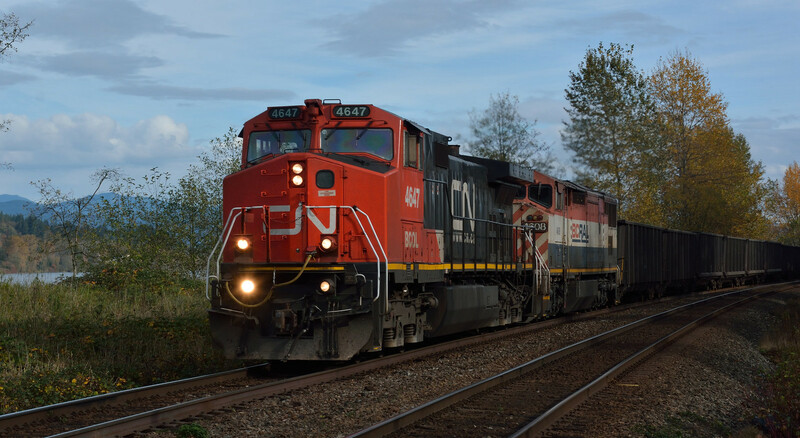 Second, a shot taken on October 1, of CN 843 heading west at Mile 61 CN's Yale Subdivision, near Popkum. Thanks for these. 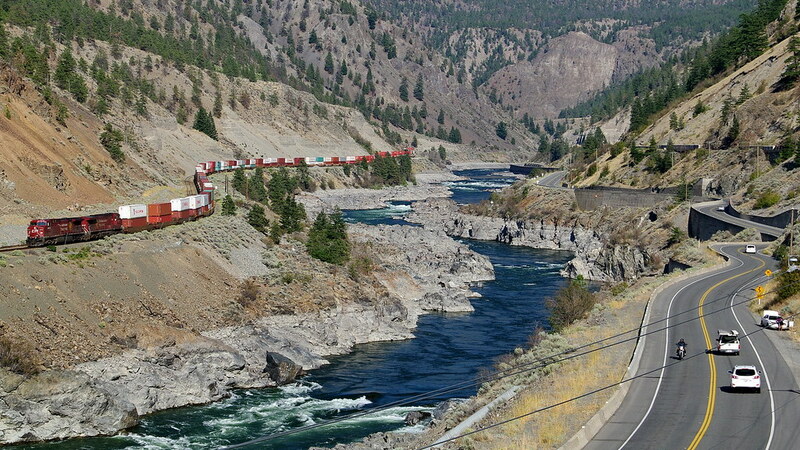 I've only stopped at Skihist once, but that was the only time I've been through the Hwy-1 canyon since I've become a train-fan. So I'm 100% at this location, but just once in 2013 isn't enough. Some day, I need to take that highway route again, with enough time to stop and enjoy it. 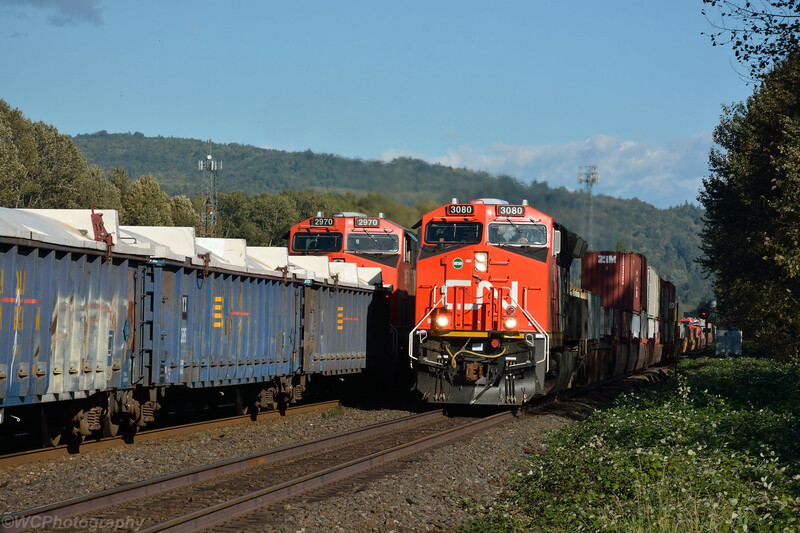 A pair of BC Rail GE's pull a westbound sulfer train near Mile 102 on CN's Yale Subdivision on October 23, 2016. 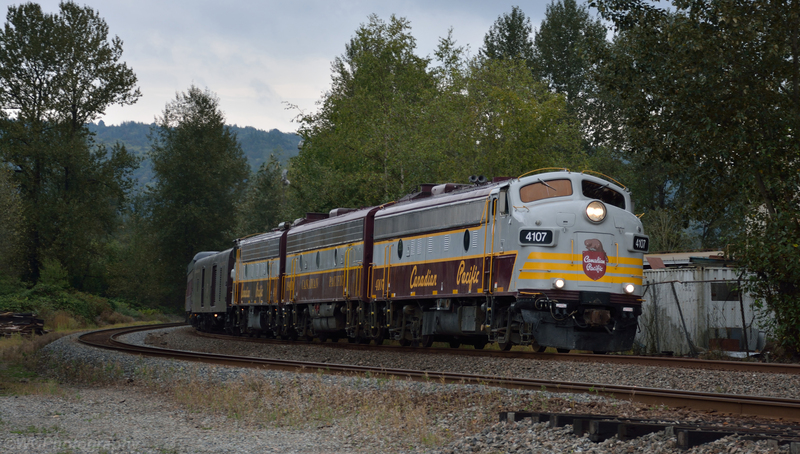 Despite being repainted, 4647 retains the distinctive twin sets of ditchlights unique to BC Rail locomotives. 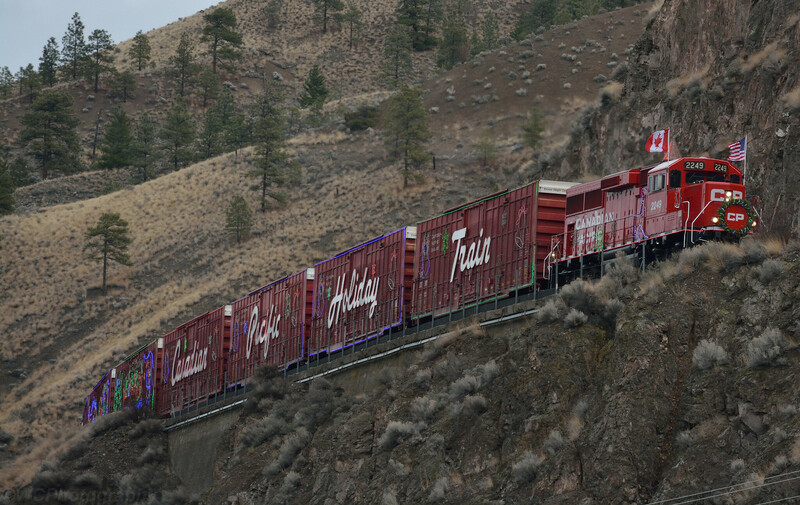 A few shots of the westbound CP Holiday Train travelling along the Thompson and Fraser River canyons on it's way to Port Coquitlam. 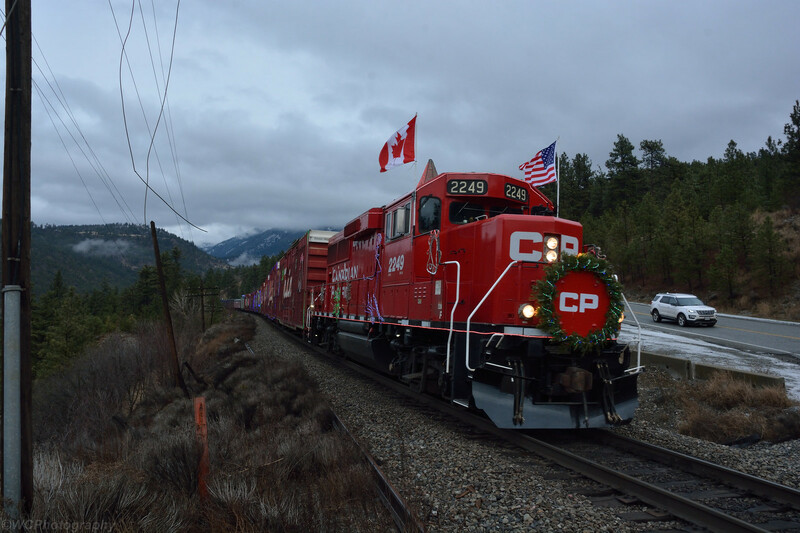 This train ran westward on CP's Thompson and Cascade Subdivisions, against the usual flow of traffic in the canyons, which has all westbounds run on the CN, and eastbounds use CP rails. 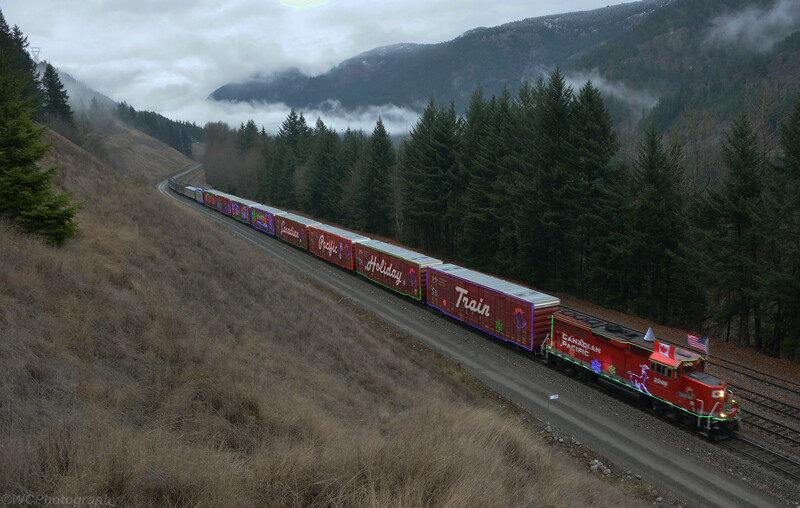 At most of the few remaining sidings there was an eastbound freight waiting for the Holiday train to get out of the way. 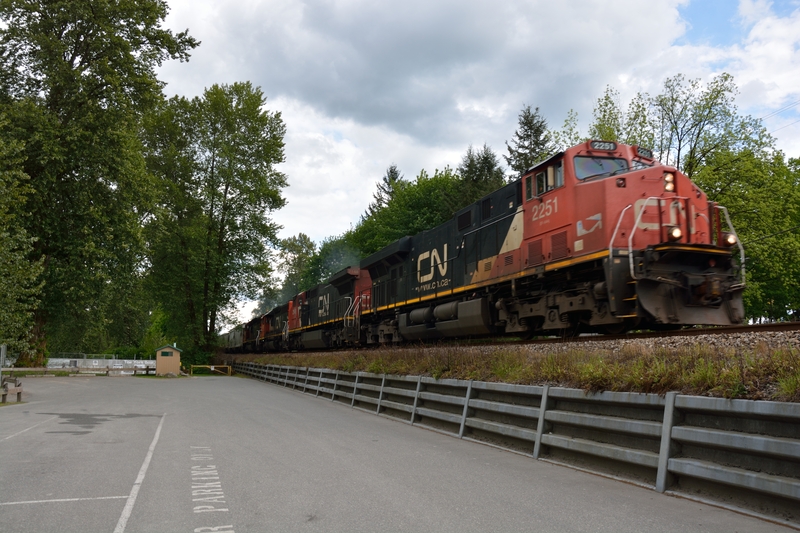 Two views of CN freights travelling eastbound on CP's Cascade Subdivision near Harrison Mills. This is directional running territory with all eastbounds using CP rails, and all westbounds using CN rails.